I finally got my hands on Revlon Whimsical this week thanks to my US enabler Tammie! 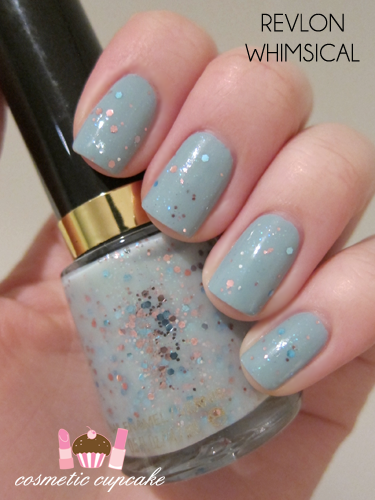 She helped me get a few lemmings once again and she very kindly helped me hunt this lovely polish down too. Whimsical is a dupe for Deborah Lippmann's magical Glitter in the Air which I own already but I don't like to use it often because it's so precious haha. I received the package yesterday and had to use it straight away! 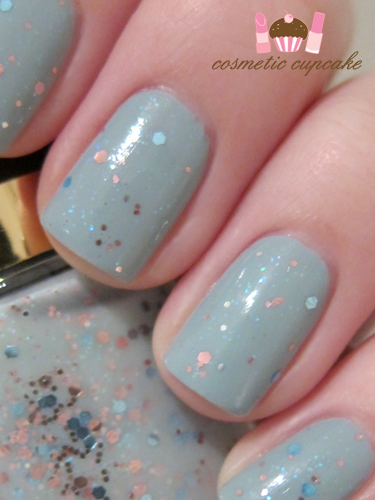 I layered two coats of Whimsical over two coats of China Glaze Sea Spray. Whimsical is pretty sheer but I wanted a subtle effect so I only applied 2 coats. Love this combo! I just love this polish. I can't wait for the end of my no buy ninety! When does your no buy end? I hope it's soooooooon! I keep going back and forth with this one...should I? or shouldn't I? It looks very unique and pretty on you. ooh just got this! So excited, looks amazing! I love this! It's in my favorite colour and has sparkles! But I'm not found of Revlon Nail Polish formulas. Never had good experience with them or maybe it's just me. so cute & so wonderful! I keep going back and forth as well. Anytime I've bought duped DL polishes, I've always regretted it and wished that I spent that money towards the real thing. I love Glitter in the Air, but I know realistically I won't wear it a lot. This polish looks fantastic on you though, but I'm still skeptical of Revlon's formula. This is such a pretty and sweet combination! I've been seeing Whimsical around a lot lately and you're wearing down my resistance! What a pretty color. Nice glitters. Such a pretty combo, sadly I can't find sea spray. This looks great on your nails! !